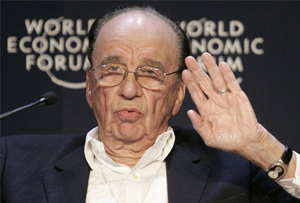 More 'humble pie' for Murdoch? The News Corp boss has been recorded slamming police officers investigating phone hacking. Not great PR - but not altogether surprising, either. You have to hand it to whoever recorded a secret meeting between arrested Sun journalists and the patriarch of parent company News Corp, Rupert Murdoch. Going into a meeting with their boss all wired up, then leaking the result? They’re hacks to the last. In the recording of the meeting, which was leaked to the Exaro website yesterday, Murdoch describes police officers investigating phone hacking allegations as ‘totally incompetent’. ‘I mean, it’s a disgrace,’ Murdoch says. ‘Here we are, two years later, and the cops are totally incompetent. It’s a surprising amount of vitriol for someone who two years ago described himself as ‘humble’ – although a boss supporting his employees isn’t altogether astonishing news. Rather touchingly, though, Murdoch said he would ‘do everything in my power to give you total support, even if you’re convicted and get six months or whatever. ‘You’re all innocent until proven guilty,’ he said. Murdoch tapes: This is the rambling, muttering, dismissive, insular, us-against-them Murdoch I know.